This essay was taken from a booklet that was published on the 50th anniversary of our parish building (the parish was established about 18 years prior to the building). Of course, it does not include the many wonderful things that have occurred over the past twenty years. Ukrainian people trace their arrival to the North American continent back to a 17thcentury group of settlers led by Captain John Smith. Within Captain Smith’s band was one Lavrenty Bohoon, a Ukrainian and a soldier. The late 19th and early 20th century saw the arrival of numbers of Ukrainians, part of that vast mass of immigrants seeking freedom and opportunity in America. Many of these immigrants realized the necessity for the formation of a church which would suit the needs and customs of Ukrainian people. In 1939, a tract of land on the corner of Verry Street and Harris Avenue was purchased from the Joseph Cavedon estate for the sole purpose of constructing a church, St. Michael’s Ukrainian Orthodox Church. Father Demetro Leschishin was pastor when this land was purchased and a church constructed at the present 74 Harris Avenue location. In October 1941 the cornerstone was laid, entombing within it a metal box with the history of the parish. One year later, the door opening rites were conducted and led by Archbishop Theodorovich with assorted dignitaries and parishioners, numbering six hundred, taking part. For fifty years St. Michael’s Ukrainian Orthodox Church has flourished and prospered at this location, satisfying not only the religious needs of its parishioners, but also contributing to social and civic events in the City of Woonsocket. 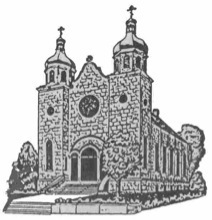 Within the parish itself many organizations were founded to aid the church financially, and to promote Ukrainian culture. These groups include the Ukrainian Woman’s Society of St. Mary, the Zaporozska Sicz, the Bojan Choir, the Bandura Male Chorus, the Ladies Sodality, the Odessa Ukrainian Dancers of Rhode Island, the Junior Ukrainian Orthodox League (U.O.L.). Each of the aforementioned groups participates in fostering the Ukrainian culture. This is done by raising funds for the care of the parish, promoting cultural understanding, perpetuating the singing of traditional songs, continuing the tradition of folk dances, and constantly working for the good of the parish community. Throughout its existence, St. Michael’s has had 15 pastors. Arriving in 1928, the Very Reverend V.A. Kaskiw laid the groundwork for the church to succeed and flourish. During his pastorate, Fr. Kaskiw organized the Ukrainian Boys Club, the Bojan Choir, the first parish Ukrainian dance group, a Ukrainian school, as well as numerous other cultural events. The Boys Club, through its successful basketball teams, made people aware of St. Michael’s Church specifically and Ukrainians generally throughout the New England and New York area. The Bojan Choir, started in the late 1920’s, is an integral part of the church liturgy. In addition, this mixed choir also participates in numerous other religious rites. Past directors have included composer O. Koshetz, M. Hyvoronsky, Professor Trofim Pasichnyk, Stephen Karas, Stephen Teper and its present director, Donna Teper Eichorn, assisted by Peter Teper. The present day Odessa Dance group traces its origins back to 1930. Here, at St. Michael’s, dance instruction was organized by Thomas Chaharyn to preserve the traditional folk dances begun in Ukraine. After many years of success, interest in the dance group waned, but was not lost. After a hiatus of many years, the heritage of dance was reborn in 1967, again under the direction of Thomas Chaharyn. In 1981, the dance group’s official name became the Odessa Dance Group of Rhode Island, now under the leadership of Natalie Michaluk Brennan. The Ukrainian school was begun to promote and teach not only the Ukrainian Orthodox religion and heritage, but also the Ukrainian language. Today’s parish religious school is led by Father William M. Wojciechowski. By July of 1946, the debt for the construction had been cleared, culminating in a mortgage burning ceremony. Officiating at this gala event was Father Peter Bilon. A new church organization was born in 1948. This male chorus took the name The Bandura Male Chorus. Its goal, then and even today, is to continue the learning and singing of Ukrainian songs, both liturgical and nationalistic. The group has conducted concerts, and has taken part in city and state cultural events. In addition, the chorus has often recorded a broadcast on the evening of January 6 to celebrate the Orthodox Christian Christmas day, January 7. In the early 1950’s, while Father Stephen Hallick was pastor, the Ladies Sodality was created. The main goals have been and are today, the raising of funds for the care of the parish, as well as working for ethnic endeavors that promote the understanding of the Ukrainian culture. In 1954, the interior of the church was decorated with the painting of icons and with the installation of an iconostasis. Artists Mychaylo Osinchuk and Peter Cholodny were commissioned for this work. A repainting of the church’s decorative interior, as well as the religiously symbolic icons was undertaken and completed by iconographer Mila Mina in early 1991. During the latter part of the 1960’s Father Vitaly Kowalenko arrived as pastor. Father Kowalenko held the pastorate of St. Michael’s for the longest period of time, 12 years. Father Kowalenko was honored in 1967 on the silver anniversary of his ordination by the most Reverend John Theodorovich, Metropolitan of the Ukrainian Orthodox Church. Also during this pastorate, in November of 1976, Primate Archbishop Metropolitan Mstyslaw participated in a day long celebration marking the founding of St. Michael’s Ukrainian Orthodox parish. Today, the stone edifice known as St. Michael’s Ukrainian Orthodox Church stands as the representative of hard work and dedication of those who say this structure as the culmination of an idea. An idea founded in the minds of immigrants and built by both first and second generation Ukrainians as the fulfillment of a need. A need for a place where people can practice the religious beliefs brought to Ukrainians by Prince Vladimir the Great in 988 A.D. Not only is the church a spiritual haven, but it is also a place where the parishioners, who are strongly nationalistic toward both America and the home of their ancestors, Ukraine, can continue to express this feeling freely. Stability, tradition, cultural preservation and religious ardor characterize this Christian community. Strong religious belief is the bulwark which has made St. Michael’s Ukrainian Orthodox Church survive and succeed.